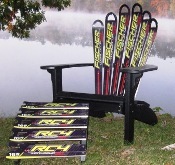 SkiChairs are extremely comfortable Adirondack style lounge chairs with curved backs and extra-long, extra-wide arms that hold 2 drinks or 2 books per arm. They are 100% hand-made in the USA using recycled skis, stainless steel fasteners and either Port Orford cedar or jet black plastic for the frames. They're works of contemporary art. Lifestyle expressions! 100% Comfort Guarantee. 5-year warranty. Port Orford cedar frame: Port Orford cedar is denser and more durable than other cedars. The cedar will weather to a silvery gray patina if left untreated. 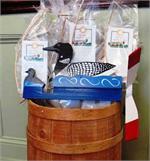 It can also be treated with a sealer or stained to match your decor. Click on View More Images to see an example of a SkiChair with a Port Orford cedar frame. Black plastic frame: Our heavy-duty, jet black recycled plastic frames are very sleek and high-tech looking. The picture above shows a SkiChair with a plastic frame. Discounts are available for the purchase of two or more SkiChairs. Many ski brand/color choices! Please Contact Us after you place your order to let us know which ski brands/colors you prefer. Or we'll surprise you with a really nice, brighly colored SkiChair. Shipping: Select UPS Ground for deliveries in the continental USA. Contact Us for shipping to Alaska or Canada.